This hotel is a real institution in this friendly seaside resort. For three generations, families, walkers, divers and cyclists have been pampered in this south-facing property, a few steps from the sea and the GR 34 long-distance footpath. 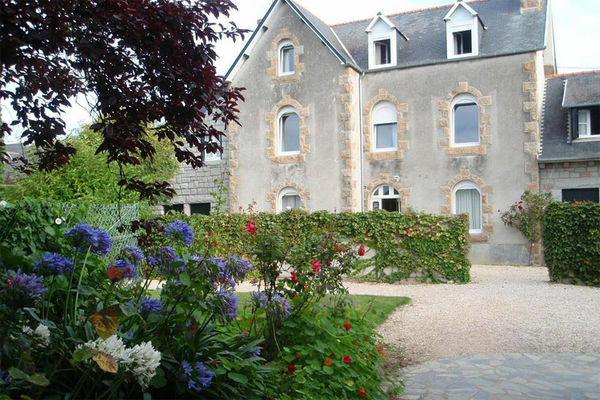 Located on the Côte de Granit Rose (Pink Granite Coast), this family hotel accommodates guests in three granite-clad buildings arranged in a large garden with flowers and trees. There are 24 spacious bedrooms, for two, three, four or five people, shared amongst the buildings. With direct access to the outside, you can enjoy the lawn and sun loungers whenever you want. Areas are provided for sports equipment. Every year, there are new developments to improve the comfort of the hotel while preserving its family atmosphere. Joëlle embodies the soul of this beautiful, authentic yet simple house, where everyone has a great time. Always available and attentive, she takes good care of her guests. During your holiday, make sure you take a trip to the lovely little Isle of Milliau.